Every day, all across Michigan, this same love of nature is passed on from one generation to the next. Their grins say it all. It’s been a long day tearing down old fences and rickety sheds, but there’s nowhere on earth this grandfather and grandson would rather be. 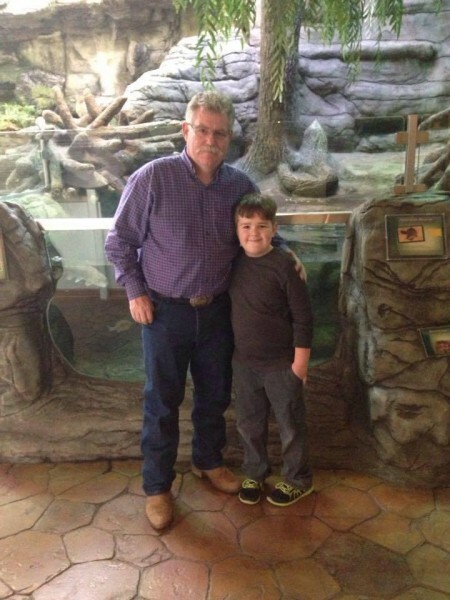 “I just wish everybody was as fortunate as I am to be able to take my grandson out in the woods and teach him the things that I learned as a boy from my own grandfather,” said Dan Johnson, 55. Every day, all across Michigan, this same love of nature is passed on from one generation to the next. That’s why it’s imperative to conserve and protect Michigan’s great outdoors, said Matt Pedigo, chairman of the Michigan Wildlife Council. “Each of these experiences is precious. We applaud everyone in Michigan who works to preserve these natural treasures,” Pedigo said. In 2013, the Michigan Wildlife Council was created to increase the public’s understanding of the importance of conservation and wildlife management. It is now in the midst of a campaign to increase non-sportsmen’s knowledge about how wildlife and the outdoors are managed and funded, as well as the role sportsmen and sportswomen play in preserving it. Johnson is one of 6,200 members of the Rocky Mountain Elk Foundation’s (RMEF) across Michigan. The organization has 18 different chapters within the state. The RMEF works diligently throughout the year with the Michigan Department of Natural Resources and partners such as the Michigan United Conservation Clubs to manage elk habitat and viewing areas for the public. The Pigeon River Country State Forest near Gaylord is one of the only places in Michigan where you’ll find elk. Next year will mark the 100th anniversary of the species’ presence in the state. 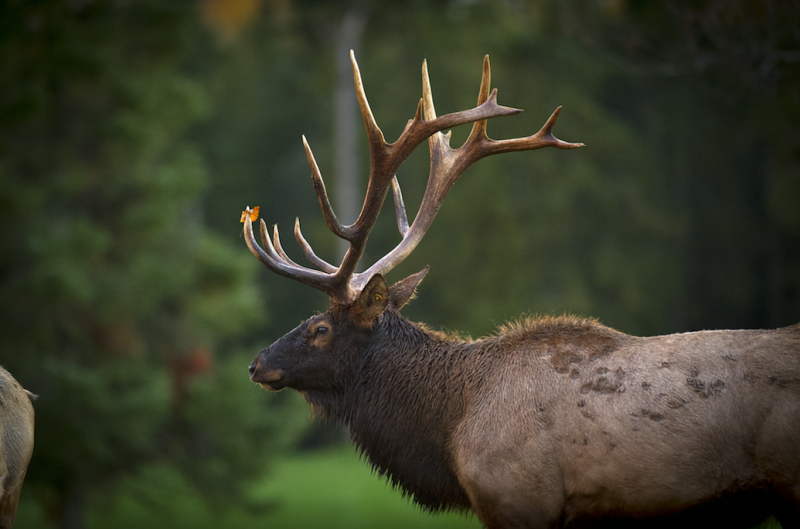 In 1918, seven elk were brought from the western United States to Wolverine, Michigan, and thanks to extensive wildlife management in the last four decades, Michigan’s elk population has grown from 200 animals to more than 1,300. Volunteers roll up their sleeves and work together side by side to improve habitat for elk in the Great Lakes State. Since the chapter’s 1984 inception in Michigan, RMEF members have completed more than 150 conservation projects valued at $5.3 million, said Jeff Van Buren, regional director. These efforts help not only elk, but also other species including deer, black bear, grouse and warblers. Many of these wildlife conservation volunteer efforts are funded through Wildlife Habitat Grants issued by the DNR. The grants are funded by hunting and fishing licenses sold each year. Johnson serves as volunteer chairman for the RMEF in Michigan. 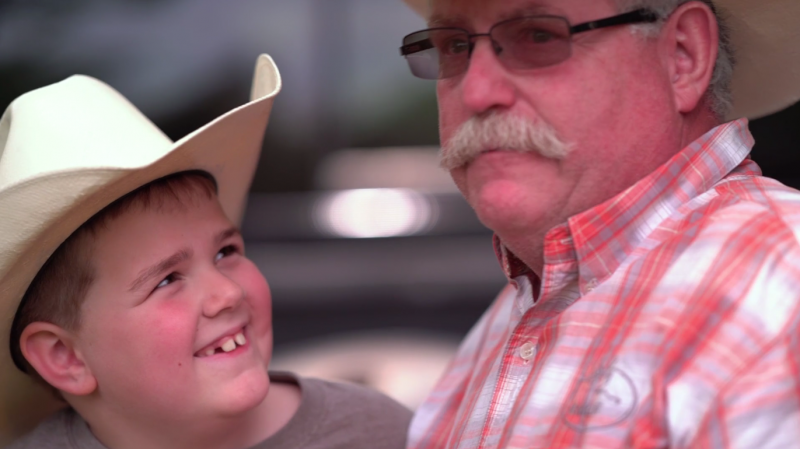 He looks forward to the group’s annual workweek for many reasons, but especially because his grandson from Oklahoma, Cayden Holmes, works alongside him. “We both really enjoy that week up in the Pigeon (River Country State Forest). We camp up there, we work with the rest of the guys, and I take him out exploring to find elk,” said Johnson, who lives in Prescott, Michigan. This summer, the pair worked near Vanderbilt with other volunteers restoring two 80-acre parcels to wildlife habitat. Fencing and an old hunting blind were torn down and removed from a wildlife opening, and debris was removed from three outbuildings that will be demolished in the next phase of the restoration. Amid the dust, you can always spot Cayden and his “Pa” by their matching white cowboy hats. Past RMEF work projects include removing invasive species and planting hundreds of apple, walnut and oak trees in the Pigeon River Country State Forest. The trees provide food and cover for elk, deer, grouse and other wildlife. Cayden has been an unofficial member of the Rocky Mountain Elk Foundation since he was a baby and attended his first RMEF annual banquet. The Holmes family now makes the trek back to Michigan every year for one of the banquets, where Cayden is in charge of holding up each auction item. Passing on this outdoor heritage is one of the RMEF’s main conservation missions. The RMEF awards thousands of grant dollars and manpower hours nationwide each year to support youth camps, expos, exhibits, recreational shooting, and archery teams and organizations, scholarships and other educational activities, Holyoak said. The hope is that, like the Johnsons, other families will learn to love the outdoors. “It’s just a big part of our family,” said Johnson’s daughter, Danielle Holmes. “My grandpa used to take me and my brother out. Then my dad would take us out hunting and fishing. It was our bonding time that we had together. Cayden and his 6-year-old sister, Brystal, spend summers in Prescott with their grandparents, Dan and Crystal. Much of their time is spent exploring the great outdoors. But that week with his only grandson in Pigeon River country is extra special, Johnson said. “He makes me proud. For a little fella to give as much as he does when he comes home … it’s a natural bond for us and for what we do,” Johnson said. And Cayden? He already can’t wait until next summer. “My Pa and I want to help nature and animals. Because if we don’t, then nature will be gone and so will the animals,” he said.